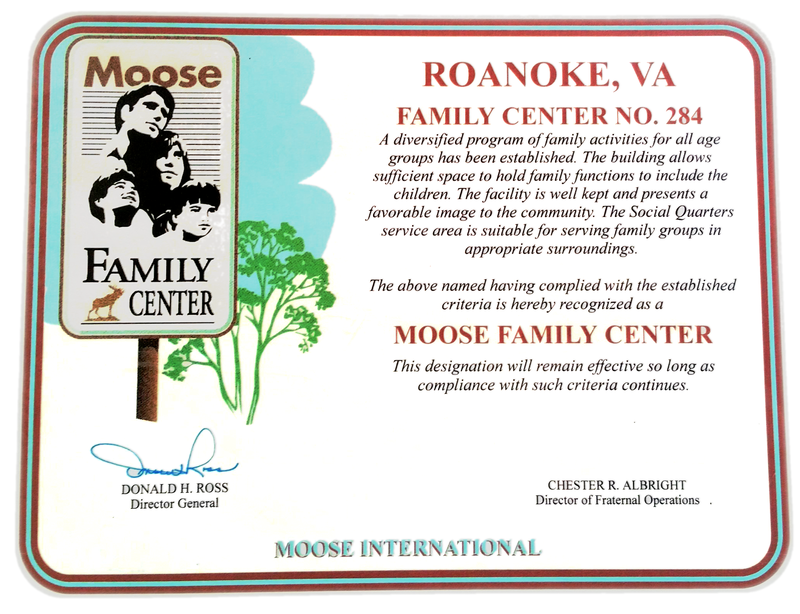 Welcome to Roanoke Moose Family Center 284, a community service organization located along route 311 near Salem VA. As a recognized Moose Family Center by Moose International, we offer a number of family friendly amenities and programs, and special arrangements can be made for public use of our facilities. We invite you to sign up for the 284 connection, a weekly e-newsletter detailing everything that’s happening at Roanoke Moose Family Center 284. Learn about weekly specials and entertainment in the social quarters and the open to the public events happening in the grand event hall. The Roanoke Moose Lodge and Family Center is often used for benefit banquets and fundraisers for local, regional, and national charities. Our grand hall can seat up to 900 people and is complemented by a fully-equipped commercial-grade kitchen staffed by a small army of volunteers.